Summer is here, but not everyone is keeping cool by the pool. Summertime usually means air conditioning systems are working overtime. The U.S. Department of Energy estimates that 6 percent of an average household’s energy use is dedicated to cooling. But you have ways to keep energy costs down, even when the temperature rises. When the basement is cooler than the rest of the building, switch the thermostat from “auto” to “fan” mode, which will circulate the cool air without using the air conditioning. A programmable thermostat also will save energy in the summer. Schell indicates a homeowner or business owner may save up to 25 percent in air conditioning energy costs by turning the thermostat 6 degrees warmer for the eight hours or more the building is not in use. A programmable thermostat enables the system to cool the house prior to your return. To help the air conditioner operate as efficiently as possible, keep its condenser coils free of grass clippings, dirt and debris throughout the summer. Simply rinse the coils with water from a hose rather than using an air compressor, which could bend the fins. Homes and businesses should include 1 square foot of attic ventilation for every 300 square feet of attic floor, according to Hellevang. “Air needs a path in as well as out, so half of the ventilation should be at the eaves and half near the peak of the roof,” he says. When outside temperatures drop in the evening, that’s the time to open the windows to let the summer breeze cool the home or use a window fan if the wind is not blowing - unless the evening is humid. Place a fan in a window or door with the fan facing to the outdoors. 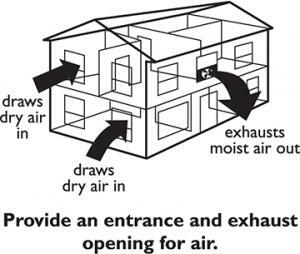 Seal the rest of the opening with cardboard, plywood or blankets so the fan can create a vacuum that draws in cool outside air through other open windows in rooms you want to cool, such as bedrooms. “If it’s very humid outside, then we’re probably better off just running the AC,” Hellevang says. Damp outside air that’s brought into the home will settle into the cooler basement, creating a damp basement during the summer. Closing shades or curtains during the day is probably the simplest energy-saving idea. “If you have windows where the sun comes shining in, there can be a significant heat load from the solar energy coming into the house, so closing the blinds or shades to minimize that solar energy is a real plus,” Hellevang says.